Successfully Added Corvette - Quadband Dual-SIM Slider Cellphone to your Shopping Cart. Meet the Corvette Cellphone, first in its class for style and substance. If you're looking for a quad band dual SIM China mobile phone that will function as well as it feels in your hand then The Corvette Cellphone is the one to get! Plus The Corvette Cellphone also comes with a free 2GB TF microSD card! Why you should get this phone...The Corvette Cellphone is a well-built, solidly put together quad band dual sim 2.8 inch touchscreen phone. Globally there are four different GSM frequencies: 850, 900, 1800, and 1900MHZ. The Corvette Cellphone operates on all of them effortlessly and therefore is a true world phone. It comes with dual (two) SIM slots allowing you to associate two phone numbers with one phone. Most importantly it comes with a 2.8 inch touchscreen with a strategic interface so you can control life and work from the convenience of your mobile phone. Why you will love this phone...A still photo and video digital camera, an MP3 and MP4 player, sound recorder, and endless productivity tools are just some of the extras this phone has to offer. But the one feature which allows The Corvette to stand head and shoulders above same class Chinese phones is its two directional slider. Slide the phone one way to reveal its keypad. Slide the phone the other way to reveal the media player buttons. The same type of advanced design which made the Nokia N-series such a hit has now been incorporated into the awesome Corvette Phone! The Corvette Cellphone is just a click of the button away. Order yours today and we'll ship it out within 24 hours. Then in a few days, your life will change for the better. Way better. Brought to you by the leader in online electronics - Chinavasion. Free 2GB microSD card included! 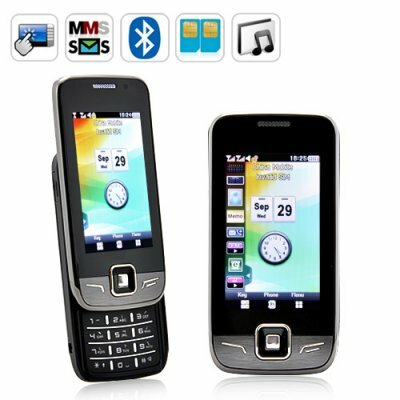 Loaded with multimedia features and comes with 2 GB TF/ micro SD card free. No, this phone is better than the iPhone! Unlike the iPhone, the Corvetter Cellphone comes fully unlocked and ready for use with any network or carrier straight out of the box. You do not need to use any firmware hacks and risk "bricking" the phone. The Corvetter also has dual SIM, Micro SD slot, video recording functionality and a lot more (unlike the iPhone). Very fast shipping. Only 2 days shipped to Malaysia. Veru efficient. The phone is very good looking and amazing funtions. Thanks Chinavasion. Keep it up..
Volevo informarvi sulla mia esperienza di acquisto di questo cellulare su Chinavasion. Non credo più alla scarsa qualità dei prodotti Cinesi,oramai sono diversi ordini che faccio qui da Chinavasion e la qualità è eccelllente,compresa quello di questo cellulare che ,per il prezzo ,è strabiliante. Super consigliato a tutti,costa poco e va benissimo. on 2010-11-05 17:37:14 Very fantastic mobile!